The trials of Job and his unwavering devotion to God are well known to Biblically studious adults, and now, that same story is accessible to children. 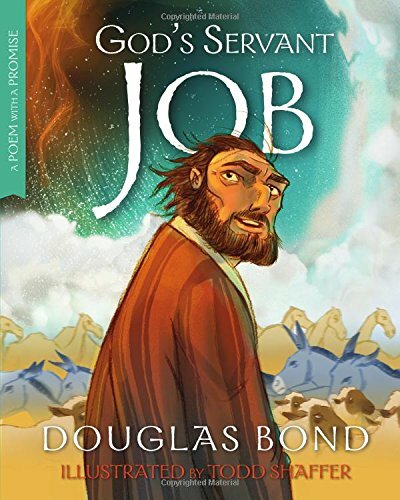 Douglas Bond has crafted the story of Job into verse form, and employed the considerable talents of Todd Shaffer to illustrate the tale. God’s Servant Job: A Poem with a Promise brims with joy, anguish, and revelation. True to the themes and characters of the Biblical story, Bond uses rhyme to engagingly present the plotline of Job. Just as in the Biblical narrative, Job is a man of great wealth, praised by God, allowed to be tested by Satan and his friends, and throughout all refuses to curse the God in charge of each event. The powerful statements of accepting from God both the good and the bad are taken directly from the text. Commentary also makes it into the verse, noting that although Job does complain and question God, this is not the same as cursing Him. Job’s tale is powerfully and completely told, a testament to Bond’s skill as a poet. Shaffer’s bold illustrations easily depict both the pastoral setting of Job’s home and the celestial realm where Satan meets with God. Richly colored, the pages are nevertheless focused on furthering the story rather than filled to the brim with distracting elements. Employing a cartoon style, the characters are given facial expressions nearly able to tell the story on their own. Young children will enjoy the verse structure, while I assume (given that my oldest is barely 4…still “young”) older children will appreciate both verse and pictures, as well as being intrigued by the story itself. Job’s tale is full of teaching opportunity, and parents now have a solid children’s book to begin broaching these themes and truths about God and His servants. To this end, Bond has included a quiz and discussion questions at the end of the book. Kudos to Douglas Bond and Todd Shaffer. Although some may find this "re-invention" of a Biblical story into verse with pictures slightly off-putting, I encourage an open mind. God is glorified, the scriptures are well represented, and once more the story is being passed down to the next generation. All her life Alaina traveled. As a child it was through novels, history books, and biographies. She has never lost a game of Risk to Joshua. Including the Star Wars and Lord of the Rings editions.